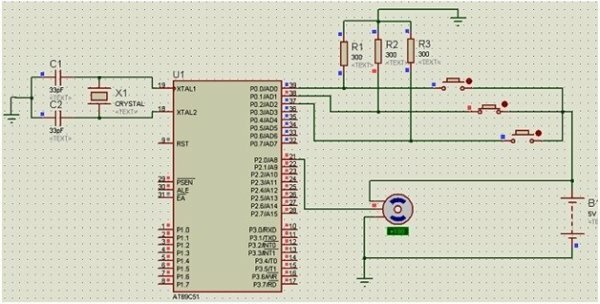 servo motor interfacing WITH 8051 MICROCONTROLLER: This article is about interfacing of servo motor with 8051 microcontroller. You will learn how to interface and control this motor using 8051 microcontroller. Servo motors are used in robotics, embedded systems and industries because they are very precise and reliable. They are used to operate remote control toy cars, airplanes or robots. Their motion can be controlled by rotating them in particular angle. Servo motor can be controlled by PWM signal. In this article we will interface servo motor with 8051 microcontroller and control its speed. I will recommend you to read a article on how to used keil compiler and how to use I/O ports of 8051 microcontroller before learning about interfacing servo motor with 8051. It consists of a closed loop system. Positive feedback is given to control the motion and position of the shaft. Feedback signal is generated by comparing output signal and reference input signal. Now, this feedback signal will act as input signal to control device. This signal will remain present as long as there remains a difference between reference input signal and output signal. So we have to maintain output of this system at desired value in presence of noises. Servo motor is controlled by PWM (Pulse with Modulation) technique in which we control the angle of rotation through the duration of pulse applied to its Control pin. First two wires are used for giving power to motor. The control signal is connected with microcontroller to feed PWM signals. Gear and potentiometer control the DC motor in it. Servo motor can turn to 90, 180 degree in either direction and can go up to 360 degrees. Turning angle depends on manufacturing. 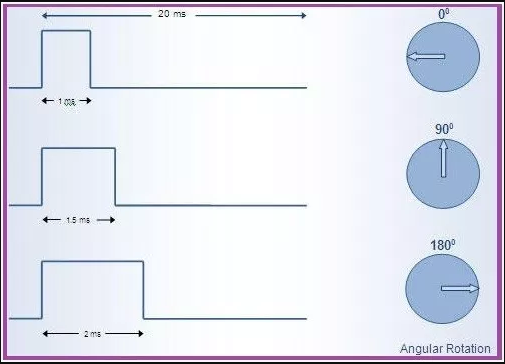 The servo motor expects a pulse after every 20ms. Length of pulse determines how far the motor turns. The shaft angle exceeds with increase of pulse width. The duration of that logic 1 pulse can be from 1ms to 2ms. So we can say that pulse duration between 1ms to 2ms can rotate Servo motor to any angle that is between 0 and 180 degree. We will control servo motor with AT89C51 microcontroller. Servo motor red and black wires are connected to battery and ground respectively. Its control wire is connected with any port pin of microcontroller. P2 of 8051 microcontroller is used as output port. Its lower one pin is used which is connected with control pin of servo to give logic input to servo motor. P0 of 8051 microcontroller is used as output port. Its lower three pins are connected with push buttons so that we can manually start the motor. 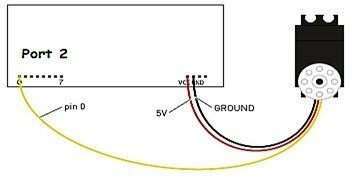 5V battery is used to give input to servo motor. When we start the simulation, motor will not rotate until any button is pressed. When 1st push button is pressed, servo motor will rotate up to 90 degree. When I press 2nd push button, it can rotate up to 180 degree and stops. And when 3rd push button is pressed, it will rotate up to 270 degrees.